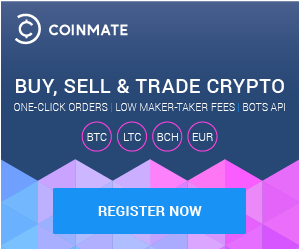 CoinMate.io allows advanced traders to interact with the bitcoin exchange through an API. Once you are logged into the exchange, go into the Accounts page. From here, select the API tab to get access to your credentials. Then generate your API keys, and you will be sent an email with a verification code, or Google Authenticator if you have activated this on your account. Once you generate keys, your public key will be shown to you, and you will be shown your private keys once. Please make sure that this private key is kept safe and secure. You can also generate new keys at any time, which will invalidate keys already issued. Please note, we strongly suggest two-factor authentication on your accounts to prevent misuse of API access to your account.